The family struggled. Acevedo’s father worked as a sweeper to support his family until he found better-paying work as a machine operator. While his father worked, Acevedo taught himself English by watching TV and hanging out with English-speaking classmates. By the time he reached high school, he had almost forgotten Spanish altogether. “I had to take a high school Spanish class just to keep up,” he said. 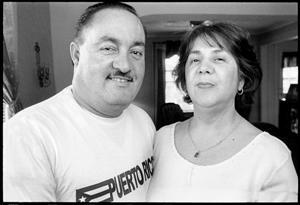 During a recent late afternoon at his home on Booth Street, Acevedo, now 57, sat at his dining room table, wearing a Puerto Rican flag t-shirt and khaki shorts, surrounded by family — including his wife Deya, who was busy preparing food, and two of his six grandchildren. He talked about how his experiences growing up as a Puerto Rican immigrant changed his life — and inspired him to become a bilingual teacher. Instead, he worked at a tannery, got married, and had children. When the Park East freeway was built in the 1970s, he was forced to leave the East Side, along with many other Latino immigrants, and moved to Riverwest. More than two decades later, the experience still frustrates him. When he moved to Riverwest, he noticed that the neighborhood children needed something to do, just like he did growing up across the river. “I saw a lot of need,” he said. “I became a mentor to them.” He started coaching Little League, tutoring kids after-school, and working for the Milwaukee Public Schools Recreational Department. After a few years, the Rec. Department offered to help pay his way through UWM. He jumped at the opportunity. He received his teaching certificate in 1991, and went to work as a bilingual teacher — a job he has held, at various neighborhood schools, ever since.